The perfect afternoon begins by cruising the slopes of Diamond Head. Then follow the trail of volcanoes winding along the shoreline from Hanauma Bay to the Halona Blowhole - where plumes of sea spray burst skyward through ancient lava tubes! Enjoy myths, legends, & fascinating trivia while traveling the stunning East Coast. Finish high atop the wind-whipped Nu'uanu Pali Lookout. Take an afternoon getaway that will sweep you along the stunningly rugged eastern coast of Oʻahu and up to the windswept cliffs of the Nuʻuanu Pali. Your tour guide will show you all the best this beautiful corner of the island has to offer-and personalize the experience with stories and history along the way. It’s an early afternoon pickup that begins with your E Noa guide’s greeting of Aloha. The perfect afternoon begins on the slopes of Diamond Head, Hawaii’s most famous landmark. Seabirds soar above the island’s windswept eastern coastline and invite you to view the crystal clear waters of Hanauma Bay, sheltered in the remains of an ancient volcanic crater. 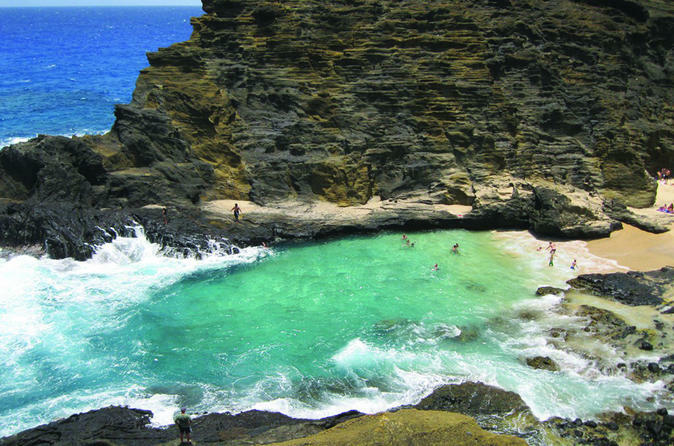 Your guide points out ancient lava fields descending into the sea and Halona Blowhole, a natural wonder where lava tubes meet the crashing surf, where geysers of water burst forth from the dark rocks in syncopation with the sea. Sandy Beach, Makapuʻu, Waimanalo, Sherwood Forest. These are the body-surfing playgrounds that draw locals from all around the island. Beware. It is not as easy as it looks! Next you turn towards Oahu’s lushly green Koʻolau Mountain Range, and begin the ascent. Soon you find yourself high atop the Nuʻuanu Pali Lookout, secluded valleys and misty peaks stretched all around you. The wind is fierce as you look out from the spectacular and historic viewpoint and your guide tells you of ancient Hawaiian battles fiercely fought.